This Flyboys Kids Flightsuit is great for Junior Pilots. Military patch selections are available. Flyboys kid's flight suits and patches have the best authenticity, realism, detail and value. 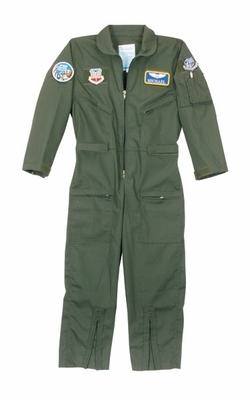 Aviation flight suits are great for junior pilots and are the perfect complement to your child's active imagination! The Flyboys Children's Flight Suits are a cotton/poly blend available in four sizes covering toddlers through about age 8-9. Sturdy and comfortable for wear and tear kids put clothes through. Each suit or jacket has four Velcro attach points for our real patches, adjustable waist straps, and zippered pockets. The clothing label is even made of the same soft Tyvek material as the real thing! Flyboys manufactures in one color, because 99% of military pilots wear Olive Drab flight suits, not blue or black or orange - plus they are made with cheap woven patches that are sewn on - and not even realistic! We give you the ability to pick and choose what service (Air Force, Navy, Army), which Command and a great selection of aircraft type your child wants on his or her suit. You get to choose a nametag with Air Force, Navy or Army Pilot wings customized with the nickname you want on it. Five sizes of flight suits are available (S- XXL) but we do recognize that children grow quickly. The sizing recommendation chart takes this into consideration. All of these suits are roomy and allow for growth. In order to maximize the amount of time your child can wear the suit - you could even select a size that might be a little larger than they need. Many customers have said they roll up the sleeves and/or temporarily hem the legs to max out the value from the suit. The sizes are guidelines if you don't have access to the child to take the actual measurements. This Children's Flight Jacket is a reproduction of a classic bomber and is a huge hit with children and youths. Childrens MA-1 Flight Jacket with patches is a well made reproduction of the famous MA-1.